1. 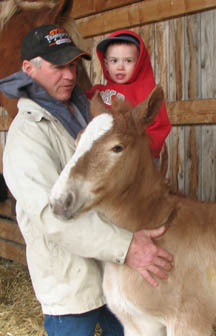 An owner of the foal being nominated MUST be a member of the Wild Rose Draft Horse Association. 2. No nominations will be accepted without the $50.00 nomination fee. 3. 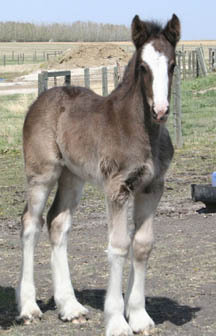 The Futurity is open to Belgians, Clydesdales, Percherons, Shires and Suffolks, foaled anywhere in North America. 4. Fillies, colts and geldings (foals of the current year) are eligible for nomination, but must be registered or notified prior to being shown. 5. All nominations close at the WRDHA annual meeting usually held the first week in February. Mailed nominations must be postmarked prior to the date of the meeting. 6. 40% of the nomination fee goes to the yearling purse. The following year, 40% of the nomination fees goes to the 2 year old purse. 20% of the nomination fee goes to the WRDHA for administration. 7. 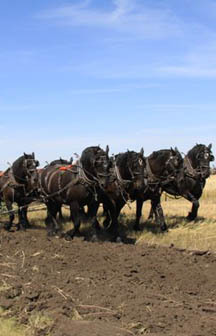 Nominations, entries and payouts will be handled by the Wild Rose Draft Horse Association. 8. Multiple nominations are gladly accepted. 9. Any disputes will be dealt with at the discretion of the WRDHA Futurity Committee. 10. 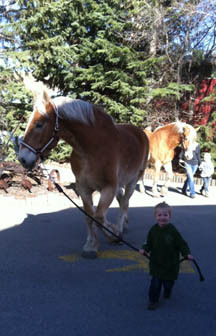 36 inches is the maximum length for a show stick or whip in all halter classes. 1. 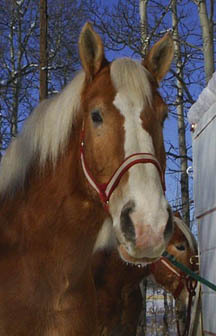 An owner of the horse being entered MUST be a member of the Wild Rose Draft Horse Association. 2. All horses being entered must have been previously nominated. 4. All entries must be postmarked no later than May 31st. 5. There will be ten paid placings in each class but yearlings will be placed to 11th. 6. 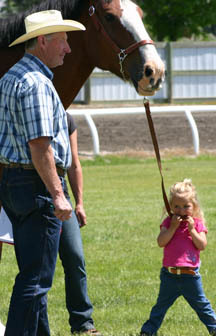 Yearlings will be shown in halter class only. 7. 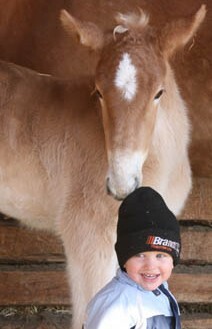 Two year olds will be shown in three divisions, halter, rail/cart, and pattern driving. Final placings will be determined by an accumulation of points from all three classes. 8. 100% of the entry fees go to the purse for the class entered (yearling or 2 year old), plus 40% of the nomination fees, plus sponsorships, if applicable. 9. 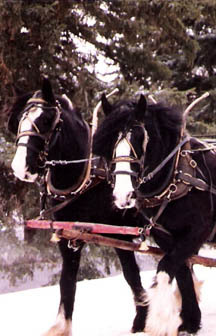 Entries and payouts will be handled by the Wild Rose Draft Horse Association. 10. Payouts will be made to the owner of the horse as recorded on the entry form and registration papers. 11. Horses can be entered by any subsequent owner providing the Registration papers have been transferred into the new owner’s name, and the new owner is a member of the WRDHA. 12. Multiple entries are gladly accepted. 13. Any disputes will be dealt with at the discretion of the WRDHA Futurity Committee. 14. 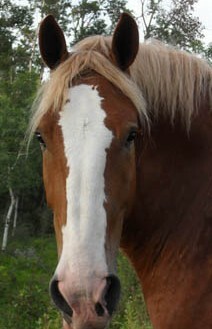 36 inches is the maximum length for a show stick or whip in all halter classes. Classes will consist of three equal divisions, where points are combined to determine a winner. Order of showing for the Pattern Class will be determined by a draw at least one hour prior to the class. 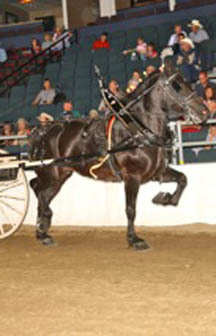 Horses must show in all three divisions to qualify for prize money awarded. If there is a tie in the total amount of points at the conclusion of the three divisions, the horse placing highest in the halter division will be awarded the higher placing. 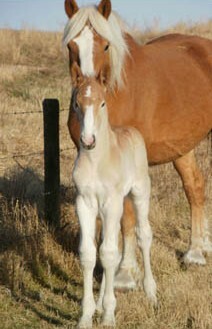 Emphasis will be placed on an animal that has correct conformation, and is sound on all feet and legs. Balance, breed type, form to function, smoothness of body parts, eye appeal, and action will all be considered. All breeds, all sexes are to be shown in the same class. 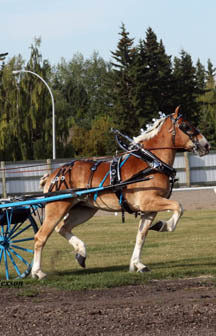 Designed to show a free and easy moving animal that is relaxed, with alert ears, moving balanced with a non-intimidated way of going, and bright and responsive to the driver at various gaits, all breeds and all sexes to be shown in the same class. 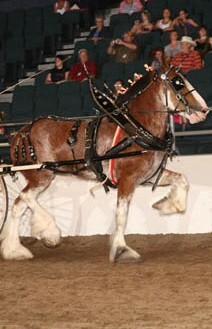 Rail work in both directions of the ring will consist of walking and trotting. 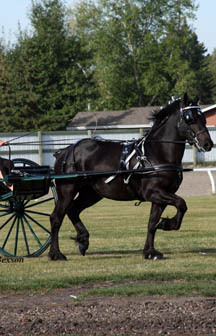 Judging will be based on the horse’s overall performance and way of going, as well as its ability to hold the designated gait. 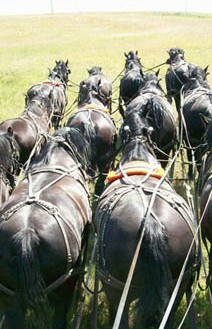 Action, headset, type, and eye appeal all to count, horses may be asked to back. 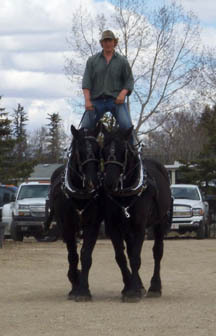 This will consist of an individual pattern, or work, designed to show how well trained the horse is. It will be a simple pattern designed for a 2 year old. 1). Enter the Arena at a Walk towards the Right and Trot one complete circle. 2). Cut a Figure 8 and stop in the centre of the Figure 8. 3). Fan Left 90 Degrees and Pause. Then Fan Right 180 Degrees and Pause. Fan Left 90 Degrees. 4). 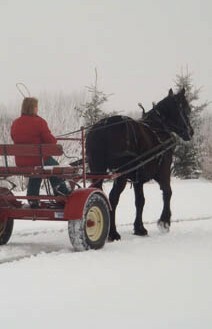 With Header (optional) Driver is to pick up both forelegs. 5). At will, go to the Right and Enter the Keyhole. Maneuver/Drive within the Keyhole to the LEFT then Exit. 6) Turn around at will and re-enter the Keyhole. Maneuver/Drive within the Keyhole to the RIGHT and Exit. 7). Got to the Left and Walk through the rails (Cart Wheels must be completely past the rails). – Then Back clear through the rails. – Then Drive to the Right of the rails and Exit the Arena at will. **NOTE: Each of the Segments, (1), (2), and (3) of the Keyhole are being Judged individually. If, within any ONE of the Segments, the white line is touched, the score will be Zero. For Example: Entering the Keyhole, if your horse or equipment touch/cross the white line while Entering, you will be scored Zero. A knocked over rail will result in a 0 score, if the rail is rubbed but not knocked off the scoring is at the discression of the judge. Any driver breaking pattern on any obstacle results in a zero for that obstacle. DISMISSAL – excessive abuse; horse/driver falling on ground; excessive use of whip; or horse’s behavior is considered to be a danger to themselves or others. 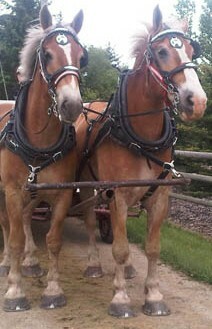 All horses are to be shown in standard equipment. All exhibitors to show in appropriate attire. 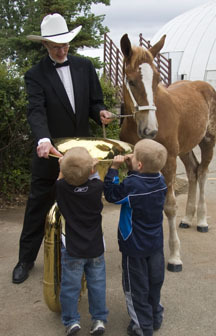 Utilization of inhumane training devices and/or equipment will not be tolerated in the show ring or warm up area, and will be cause for elimination from the competition. Horses and equipment are subject to examination by the futurity committee and/or judge both in the ring and in the warm up area. 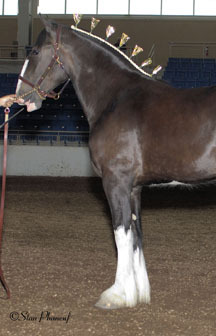 36 inches is the maximum length for a show stick or whip in all halter classes. The exhibitor’s order of showing may be changed as long as the futurity committee and the announcer are informed of any changes at the time of the “position draw”, at least one hour before the competition. 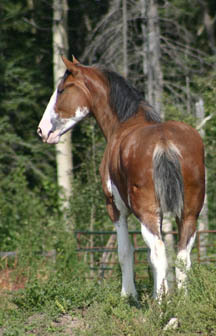 ANY DISPUTES WILL BE DEALT WITH AT THE DISCRETION OF THE WILD ROSE DRAFT HORSE FUTURITY COMMITTEE.